Is This Barack Obama Praying in a Mosque? A viral message claims that​ former President Barack Obama prayed with Muslims in the White House after canceling The Christian National Day of Prayer. And what was it he said to all of you that were in Washington, DC last week..... don't question my religion? HE PRAYS WITH THE MUSLIMS!! This is OUR President at a MOSQUE prayer session LAST WEEK AT THE WHITE HOUSE, on the site where the INAUGURATION is held every 4 years! He canceled OUR CHRISTIAN "NATIONAL!!!! DAY OF PRAYER"... NOW... THIS. Forward this to every American Citizen as the media won't! Ridiculous on the face of it. How could there have been "a mosque prayer session at the White House" when there's no mosque on or near the White House grounds? Moreover, the image clearly does not show Obama praying; it shows him taking off his shoes. Finally, Obama doesn't pray in mosques; he's a Christian. 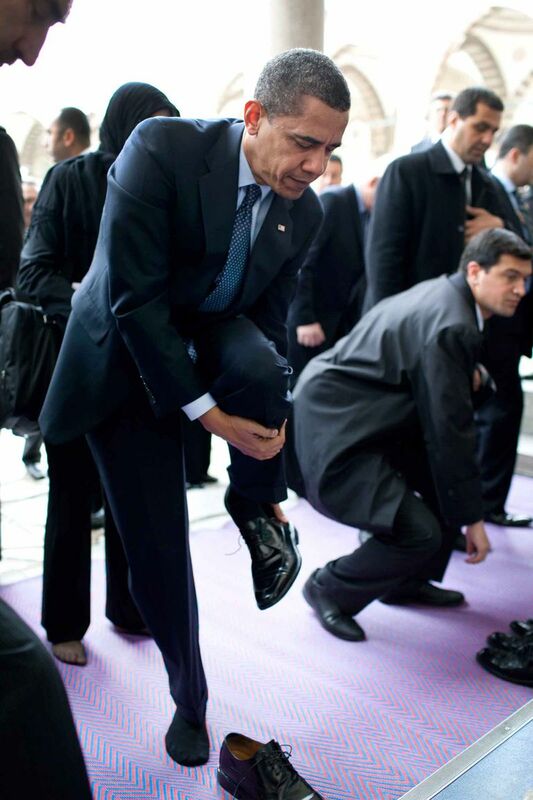 What the photograph does, in fact, show is President Obama removing his shoes, per custom, before entering the famous Sultan Ahmed Mosque ("Blue Mosque") in Istanbul during his April 2009 state visit to Turkey. Obama toured the mosque. He didn't pray in it. As to the claim that Obama "canceled our Christian National Day of Prayer," that's false on two counts: one, Obama did not cancel the National Day of Prayer; two, the National Day of Prayer isn't a Christian observance, it's an interfaith observance, and has been ever since it was designated so by Ronald Reagan in the 1980s. Bailey, Holly. Obama at the Blue Mosque . Newsweek.com, 7 Apr. 2009. Image: U.S. President Obama Visits the Blue Mosque . MSNBC, 8 April 2009. Obama Signs Day of Prayer Proclamation, Associated Press, 7 May 2009. With President Obama at the Sultan Ahmed Mosque in Istanbul. U.S. State Department blog, 7 April 2009.